and invite in the leader‐as‐host. Flow of information throughout the team. Rich and diverse relationships among the team members and with the broader community. A common vision that unites the team. I created this visual to illustrate the connection and the payoff of the three elements. When the three elements of information flow, relationships, and vision are present the payoff is creativity that produces ideas and possibilities to advance toward the goals of the team. 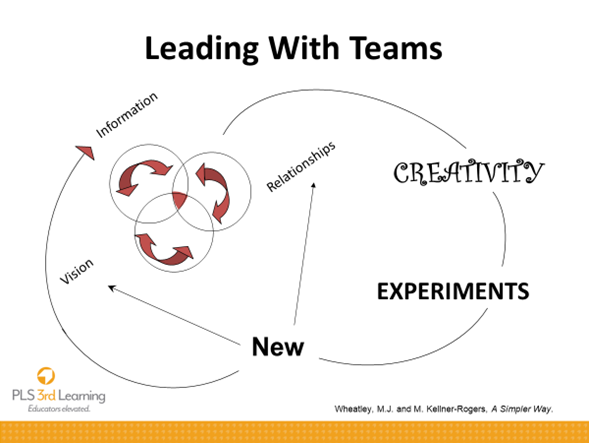 Experimentation and risk taking with the new ideas produce new information, or new relationships and a tightened or broaden vision; pushing the team to continuous improvement or transformation. Constantly have teams focus on the common vision that teams and the larger organization wish to accomplish. 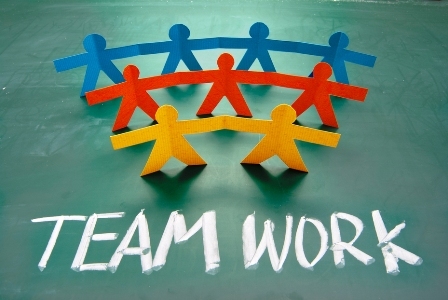 How do the goals of an individual team align with the vision of the whole school? Consider dedicating some discussion time to elements of the school vision at each staff meeting. Perhaps a question posed for responses in small groups: “Share an example of our students being empowered as learners.” Too often, visiting the mission and vision is a once-a-year staff activity. Build rich and diverse relationships within a school and among the school staff and the community. As a leader, how do you create ways for teachers to work with colleagues across content areas and grade levels? I worked with an upper school administrator who selected several students whose academic progress was insufficient. He then brought together teams of teachers who had the students in their classes and provided time for the teachers to meet, develop a plan, assess the impact of their plan and celebrate progress or redesign plans. This led to teachers from various departments observing in each other’s classrooms and engaging in conversations about shared commitment to student success (shared vision). How are staff members encouraged to form parent and community relationships which can become resources for achieving the school goals? Do you and your staff know the contacts that each other have in the community? Consider collecting a list of “who do you know?” from the staff and providing it as a resource for all. Wanting an attorney who might serve as a resource to an exhibition group of students, a teacher’s quick look at the staff resources list shows a colleague who can make the connection. Create processes for information to flow throughout the organization and the community. How well informed are your Primary Years Programme teachers about the learning skills required for students to be successful at the start of Middle Years Programme? Do parents with students at several grade levels have more information about what’s happening across the school than members of your leadership team? How do you communicate to team members that they have a responsibility to “share the news,” good and bad, with their teammates? One school head holds each leadership meeting in a different member’s work space. That member is given the first 15 minutes of the meeting. Five minutes to brag and ten minutes to ask for assistance with a current problem or opportunity. Promote experimentation with ideas to move the team closer to reaching the goals from the vision. Experimentation means that failing is an acceptable and expected way to learn and move closer to the desired outcome. In Empower: What Happens When Students Own Their Learning, Spenser and Juliani (2017) identify failing as a process that is temporary and different from failure which could be seen as being final. Modelling is a critical leadership behavior to build this culture. How many of your team members can tell a story about a failing their leader has experienced and shared? What experiment are you currently leading? Spenser, J., Juliani, A.J. (2017). Empower: What happens when students own their learning. Impress Books.